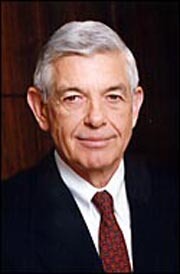 NC Business Hall of Fame -- Hugh McColl Jr.
Hugh McColl Jr. was born in Bennettsville in 1935. He graduated from the University of North Carolina at Chapel Hill in 1957 with a degree in business administration. He served two years in the U.S. Marine Corps. Junior Achievement When he got out of the Marine's, he seriously thought about joining the family's Marlboro County, SC, cotton brokerage and ginning businesses. But his father pointed his son toward the American Commercial Bank in Charlotte, where the McColl family had done business. Hired as a management trainee, McColl began is career in banking. In 1960, the bank was merged with Greensboro's Security National Bank and became North Carolina National Bank. McColl worked as a loan officer and a vice president for the bank, before being named as president in March 1982. He also was elected chairman and chief executive officer in September 1983. At that time, the bank had $12 billion in assets, $8 billion in deposits and a market capitalization of $700 million. The company operated in two states, employed 7,600 associates and generated net income of $92 million. In 1991, McColl engineered NCNB's merger with C&S/Sovran, which resulted in the formation of NationsBank, one of the country's largest banks. In April 1998, NationsBank and San Francisco-based Bank of America announced a merger that resulted in the creation of Bank of America, with headquarters in Charlotte. Under McColl’s leadership, the bank has grown to serve retail and commercial customers in 16 states and the District of Columbia through a franchise that stretches from Maryland to Florida and as far west as New Mexico. The bank also serves customers across the country through several national businesses. He retired in 2001. By the beginning of the new millenium, the bank had grown to $600 billion in assets, $8 billion in net income and a market capitalization of about $90 billion, making it one of the most highly valued financial services companies in the country and in the world. The company then operated retail branches in 22 states and the District of Columbia, employing almost 180,000 associates. In 2001, he launched an investment banking firm, McColl Partners, and been involved in other businesses. In 1989, he was named one of the "25 Most Fascinating People" by Fortune. In 1993, he was named "Banker of the Year" by The American Banker and chief executive officer of the Year by Financial World. He served on the boards of Ruddick Corporation, Sonoco Products Company, Canal Industries, Charlotte-Mecklenburg Hospital Authority, and Queens College. The McColl School of Business at Queens College is named for the Bennettsville native. McColl also has served the University of North Carolina at Chapel Hill as a member of the Kenan-Flagler Business School's Board of Visitors, a trustee of the Frank Hawkins Kenan Institute of Private Enterprises, a member of the Morehead Scholarships Central Selection Committee, and the UNC-CH Board of Visitors. The new building that houses the Kenan-Flagler Business School, which was completed in fall 1997, was named the McColl Building in his honor. McColl is married to Jane Spratt. He was named to the South Carolina Business Hall of Fame in 1990.